Leash training puppy techniques let your poodle learn basic dog commands of stand, rollover, heel and leave it. The dog obedience commands can also be taught using a training lure and giving a dog training treat to your dog once she learns the command. Use a small dog training collar to train with the leash method. Keep the collar loose around his neck and remove it when training is done. 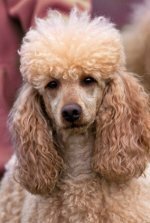 Free puppy training tips help you teach your poodle the easiest and right way to learn commands. There are books and videos that give you more insights into the right way to train your pet. To teach her to stand, say her name and "stand". Move the treat slowly above her head which encourages her to stand to follow the treat. Praise her when she stands. Want her to roll over? No problem! Make sure she's laying down. Say her name and "roll over." Move the treat over her head to one side, she'll follow it with her head and eyes. Next, move the treat up to her shoulder encouraging her to get on her back. Reward her with a belly rub. Going for a walk with your pooch means teaching him how to walk beside you, to heel and to not pull on the leash as he runs ahead of you. Leash training puppy helps him accept a leash when he is young. Teach him to follow you by walking away from him. If he runs ahead, slow down and say "slow". If he is too far behind you, walk faster and say "hurry." How to train a puppy to get him to walk beside you? Choose either your left or right side, then hit your leg on that side to get him to come to that side. Walk, then stop, walk, then stop to make sure he stays at your side. Teach him to heel by saying her name and "heel." Once she sits, teach her to turn. Teach her to not pull the leash by stopping whenever she starts pulling. Once she stops pulling, praise her. Continue stopping each time she pulls the leash and praising when she sits and stops pulling. You'll want to teach her to "leave it" so she doesn't put dangerous things into her mouth (or your new shoes! ), if she chases and catches a rabbit (yes, Holly did), or if you want her to drop the ball or frisbee when playing catch. Get some treats, and give your poodle his favorite toy to carry. Say "leave it" and offer him the treat. He'll eat it, then give him his toy and repeat. Leash training puppy and dogs is one way to train. 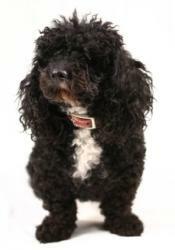 Poodles are very smart and tend to learn quickly. A short training session each day with doggie treats as rewards will have your pet learning the commands fast as she wants to please you, and make her owner happy.